Home » Everest » Everest 2019 Coverage » Everest 2019: Everest Base Camp! Everest 2019: Everest Base Camp! Well, it looks like the weather has shut down the great views of Ama Dablam, Everest and more. Climbers and trekkers are reporting rain in Namche and several inches/centimeters of snow was reported at Everest Base Camp on the Nepal side. Poor weather at EBC stoped any high mountain activity on Tuesday. Meanwhile more teams arrive at base camp in Nepal and team are streaming into Kathmandu for their journey to Lhasa and the Tibet side of Everest. As expected, the top countries for Everest climbers are, in order, India, China, US, UK and Canada. A couple of days ago I mourned the demise of detailed writing by our climbers and trekkers, so I was thrilled to find two more that are very well done. The job he does only requires a Herculean brain. Our fixer is the detail man from heaven and he has his fingers in uncountable pies. Need a chopper in 5 minutes? Stress not. 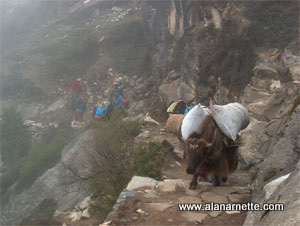 Need to negotiate the number of yaks with a Tibetan nomad? He’s there. Want a Michelin quality chef for the basecamp kitchen? Sure we’ll fish one out of the finest restaurant in Kathmandu. Bargain down a Chinese official? He’s got what it takes. Want the best Sherpa crew? Here’s your man to ask. Change rooms in a hotel? Man! The guy owns the hotel! Need specialist high altitude medicine? Look no further. Can’t find that spare part for your avalanche transceiver? He’s got one in his pocket… In short this guy is invaluable. … Her guide is Chris. I have climbed with Chris in Chamonix. He snores like a gut-shot goat. And is very relaxed. So relaxed, in fact, that he is seemingly happy to climb with me. The only person more relaxed than Chris is Rob, the cameraman. At the time of writing, he has flown his drone into a tree somewhere in northern Nepal. He made us aware of this predicament by stating simply, “I need a new drone.” I like his style. (I would have been cursing all the junipers in existence and requesting a full Sherpa search party.) As well as being an accomplished cameraman (Oscar-winner Jimmy Chin is a colleague), he’s a highly qualified climbing guide in his own right. Based in Jackson Hole, and like most extreme guys from that part of the world, he replies to nearly all statements, questions, and even Chris’ snoring with “totally”. I’m going to start doing that. I hope it will give me some credibility here. I need it. Now on to what they are experiencing on the trek. Oh my. Today we actually get to Everest Base Camp. It’s not far. Gorak Shep is 5,164-meters/16,942-feet and EBC is at 5,380-meters/17,600-feet, “Only” a gain of 440-meters/1,393-feet over 11.3 km/7 miles. From now on, distance is not measured in miles or kilometers but in time. The teahouse at Gorak was unremarkable, but it might be a “vacation” for many Everest climbers seeking a bit of a respite from base camp. Yes, this is a new reality. The trail is once again, familiar. Up and down, well-trodden dirt, almost impossible to get lost. Now it follows the top of a dirt path carved out by the glacier. When you pause and think about it, its impressive that a wall of ice carved out the gully to your right and today it is gone. The trail is narrow at times. You need to share with people going lower, those higher, yaks and more. As you trek, you begin to feel the altitude. This is no longer a joke. Now there is literally 50% less oxygen in every breath. Your pace slows and the idle chatter disappears. The path is not difficult, not a lot of ups and downs but it steadily gains elevation. If you are a climber, your adrenaline increases. If you are a trekker, your adrenaline increases. No matter if this is your first time or 25th trip, there is something magical about reaching Everest Base Camp. The Khumbu Icefall looms large. It is steeped in rich history. When George Mallory was scouting routes, he saw the Khumbu Icefall and declared it “unclimbable.” Today it stands as the largest objective danger when climbing from the Nepal side. Speaking of Mallory, his body was found in 1999 yet his parter Sandy Irvine has not. About time for a formal team to look for him, and the camera! You take more steps along the trail knowing the end is near. It’s a funny mixture of emotions. For those who have been planning this trek for years, it is literally the end. For those climbing Everest it is literally the beginning. Both perspectives yield strong emotions. A sign takes the edge off and reduces your emotions that Nepal has turned Everest into a Disneyland attraction but then you look beyond. There are countless yellow and green tents spread over the glacier. The Icefall looms above, Nuptse to the right, Pumori to the left. In the middle of your moment, yak bells disturb your survey. You step aside. Now the trail goes lower. You follow it and the endless stream of porters, Sherpas, trekkers and climbers, Yes this is a busy place, perhaps over 1,000 this year as it might be a record one for Everest. You see, for every foreigner with a permit, 300 thus far, there are at least one support Sherpa and then there are the support staff – cooks, water boys, toilet guys, yak herders and more. Yes, it has become an industry to get a few hundred people to the top of the world each spring. Another step and a left turn, then right. There is a rock wall blocking our path to this camp – how unfriendly! Yet soon you will understand its not for humans but for wandering yaks, You search for your camp. They all look alike. And random names on the banners that lack originality. There is Nepal Adventures, Nepal Treks, Nepal Climbing, Everest Summits, Everest Climbs, 8000 Meter Treks and more variations on the words: Everest, Treks, Adventure and … whatever you can associate with climbing. Sigh. Finally you hear your named called out. He is one of your sherpas from the trek that bolted ahead. You wave and smile. It’s a good feeling. Now you climb a short steep trail to a city of blue tents. “Namaste!” you hear over and over with huge smiles. Great read, Alan. “What they are experiencing on trek” is beautifully written. Thanks Alan. Another great post 🙂 I think George Mallory said that the Ice Fall was unclimbable may be because with boots with hobnails and tweed jackets, it probably was!